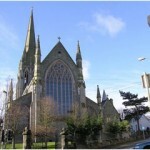 St. Eugene’s Cathedral is one of the main Churches of the Derry Diocese; it spreads a great length from Malin Head to Omagh and from Killygordon to Bellaghy. This Cathedral is greatly cherished by the people of Derry; it is beautifully designed and decorated, with much money and time invested into its breath- taking architecture. 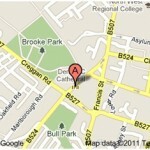 There are many beautifully sculpted pieces carved and decorated by the finest carpenters and painters. 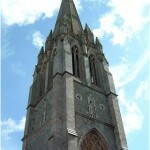 Fundraising for this cathedral began in 1840, construction was initiated in 1849. 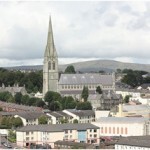 The total cost of building the cathedral amounted to just over £40,000, the money that was raised was not just in Derry, but also America where around £4,000 was raised. 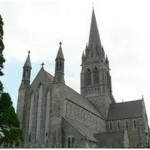 The architect that was picked to design the cathedral was J.J. McCarthy who himself had already built several quite spectacular cathedrals across the province of Ireland. 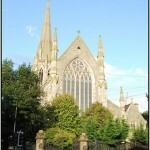 The cathedral after a great deal of work and dedication was then officially opened on 4 May 1873 by the Bishop of Time at the time, Francis Kelly. 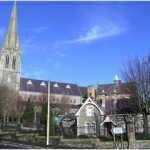 Saint Éogan was an Irishman who founded his principle monastery Ardstraw in County Tyrone, where he served as bishop until his death. Once you have entered the cathedral you will come the main area of the Cathedral, from there you can pass under the various supporting structures of the main organ gallery which had under gone an extension in 1904. Directly the Organ galley is a beautiful stained glass Rose Window with a Celtic pattern, this large stained glass window became a part of the Cathedral in1920. 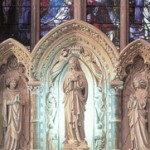 This piece of beautifully sculptured art is located directed on the North Aisle of the Cathedral. The quotation alongside it reads: ‘Springs of water, Bless the Lord, Give him Glory and Praise forever’. 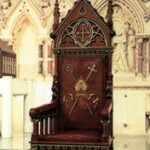 To the right of Cathedral’s the main alter is the Bishop’s chair. 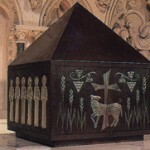 The tabernacle in silver-plated bronze was carefully sculptured and exquisitely decorated with much time and effort and successfully became a part of the Cathedral in 1989. 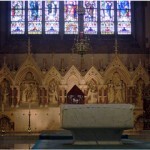 A new square altar of Carrara marble was placed under the chancel arch as a part of a major renovation in the Cathedral in 1989. The symbolic oak leaf appears on the edge of the carpet on the floor.